An original letter of correspondence between one of the Chase & Company and G. T. Smith, chairman of the Light and Water Committee of Winter Garden, Florida. Topics discussed in the letter include the committee's request about utilizing the cypress trees at Isleworth Grove and Chase & Company's decline of the proposition. Original letter from Chase & Company to G. T. Smith, January 30, 1926: box 49, folder 20.84, Chase Collection (MS 14), Special and Area Studies Collections, George A. Smathers Libraries, University of Florida, Gainesville, Florida. 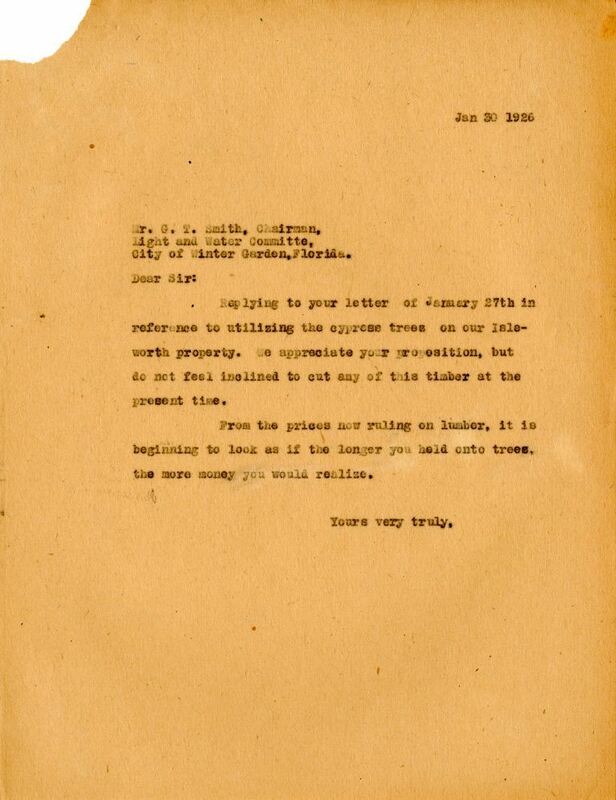 Digital reproduction of original letter from Chase & Company to G. T. Smith, January 30, 1926. City of Winter Garden, Florida. Replying to your letter of January 27th in reference to utilizing the cypress trees on our Isleworth property. We appreciate your proposition, but do not feel inclined to cut any of this timber at the present time. From the prices now ruling on lumber, it is beginning to look as if the longer you held onto trees the more money you would realize. Chase, Joshua Coffin. 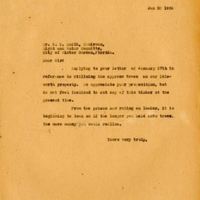 “Letter from Chase & Company to G. T. Smith (January 30, 1926).” RICHES of Central Florida accessed April 19, 2019, https://richesmi.cah.ucf.edu/omeka/items/show/2752.